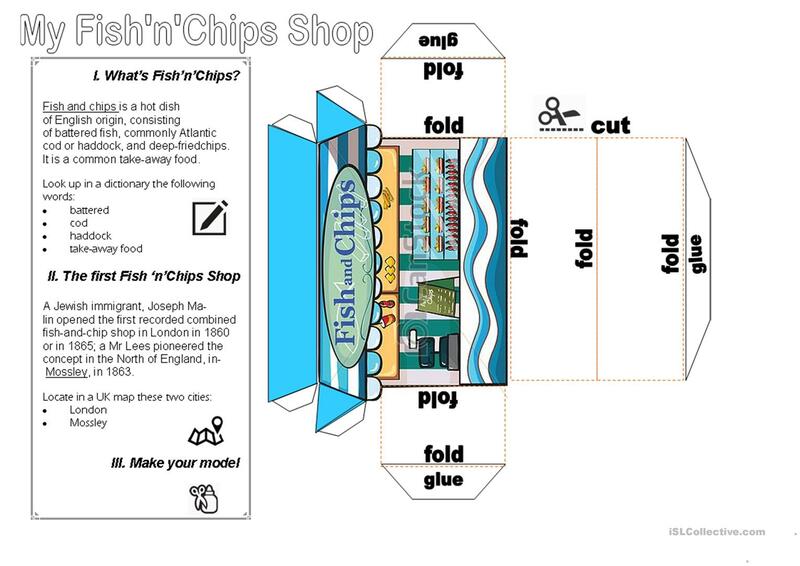 It's a papercraft activity in English for students at Primary School, in order to introduce them to British Traditional Fish and Chips. The activity introduces craft verbs as 'glue', 'cut', 'fold' and specific vocabulary as 'fish', 'chips'... The activity includes a brief history about these kind of shops and explanation about this traditional British Food. The present downloadable handout is recommended for elementary school students at Elementary (A1) and Pre-intermediate (A2) level. It is great for consolidating Verbs: Action verbs in English, and was designed for honing your groups' Speaking and Reading skills. It is focused on the theme of Food.